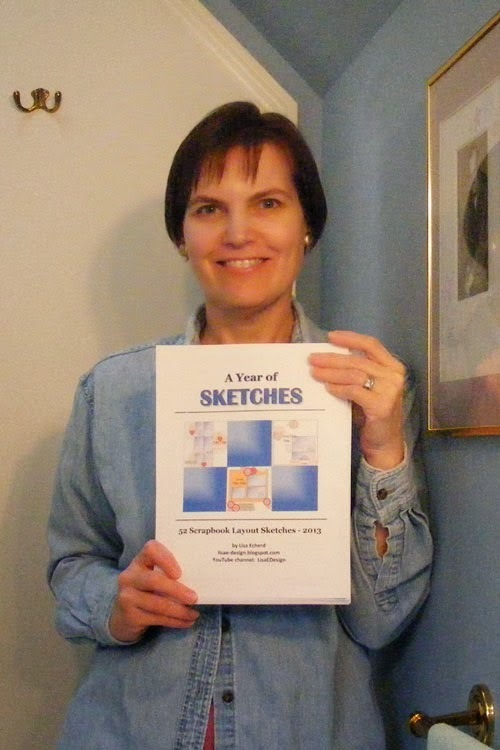 This e-book contains 52 sketches used throughout 2013 in my process videos. They are all contained in one document and organized by the number of photos suggested for each sketch. One photo, two photo, all the way up to over 14 photos per layout! Collage sketches and double page sketches are also included. Each page also contains a link to the process video created based on the sketch so you have a year's worth of handy scrapping tips right at your fingertips. The 56 page PDF is only $8 (US) and available for immediate download after payment through PayPal. After payment, you are redirected to a screen where you can complete purchase which downloads the PDF file to your computer. It may not be a great novel, but I'm proud of this collection of sketches. I think it is very helpful to have them all in one document along with a link to a supporting video. I hope you will think so, too. Yay! Congratulations to you, Lisa! This is quite an accomplishment! Hooray for you! What a wonderful accomplishment! Congratulations, such a great accomplishment. Congrats! This is at the top of my want list!! Congratulation, Lisa WAY to go. how exciting and yay for you!